09/08/2013 According to the latest figures from Statistics New Zealand, strong results in the second quarter helped building consents rise to their highest level since March 2008. Even with a 4 percent drop in June, consents were up 25.5 percent from a year earlier thanks to a 21 percent jump in April and a small increase in May. Most of this growth was in Auckland and Canterbury where it is needed the most, with the two regions accounting for 55 percent of the national total. In real number terms, 5,213 new dwellings were consented across New Zealand in the June quarter, including 593 apartments. While these results will take a while to filter through to those markets already under enormous pressure, according to ANZ Bank senior economist Mark Smith, the trend is "clearly upwards" and suggests "a more prolonged expansion dictated by usual cyclical dynamics." These figures will have implications for house prices, sales volume, and interest rates, with Reserve Bank governor Graeme Wheeler recently linking heated housing and construction market conditions with the timing of interest rate hikes. According to Graeme Wheeler, interest rate decisions "depend largely on the degree to which the growing momentum in the housing market and construction sector spills over into inflation pressures." While an up-trend in building consents is one of the things needed to alleviate pressure on the housing market, increasing demand in the building sector is also leading to rising construction costs. Residential construction costs a square metre were up 6.7 percent in June from a year ago, in a "a clear signal of the resource requirements of the construction sector" according to Mark Smith. 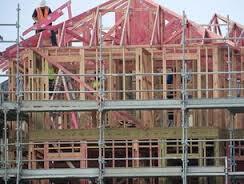 Statistics New Zealand also recorded the total value of all building work consented in the June quarter, with a $2.9 billion total comprised of $1.9 billion in home building consents and $1 billion in non-residential work. According to Statistics NZ industry and labour statistics manager Blair Cardno, "The quarterly trend for the value of non-residential building work has been increasing for a year and is now at its highest level since September 2009." While building consent trends do not take inflation into account, they certainly have an effect on the inflationary pressures felt throughout the New Zealand economy. Along with other key factors such as the release of constraints on high loan-to-value mortgages, the central bank will be watching how building consents affect the property market in the analysis of future interest rate decisions.